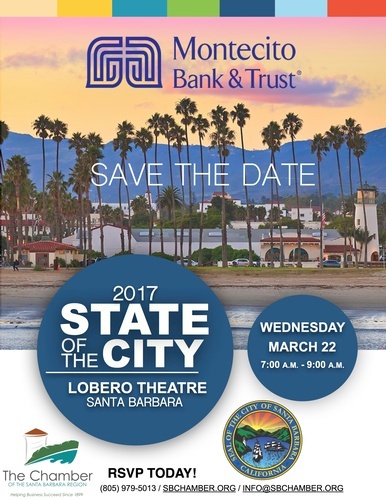 Join the Chamber of the Santa Barbara Region in partnership with the City of Santa Barbara as we host our Annual State of the City Breakfast at the Lobero Theater & El Paseo Restaurant! Sponsorship opportunities available! Please contact Stephanie by emailing Stephanie@sbchamber.org or calling (805) 979-5013. All members of the public are welcome to join us for the Mayor's State of the City Presentation. Seating will be provided immediately prior to the speech. Please contact the Chamber at (805) 965-3023 to make your reservations for the presentation portion of this event! Public Attendance for the State of the City Presentation is FREE! Coffee Service Reception & Breakfast will not be included for those attending presentation only. Please call the Chamber at (805) 965-3023 or email info@sbchamber.org to make your reservations today.